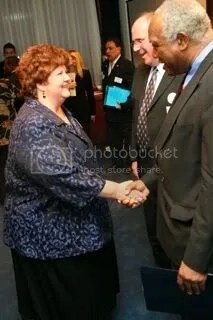 Marge Berglind greets U.S. Rep. Danny Davis (D-IL) at reception in Washington. Congressmen Jerry Weller and Danny Davis for their sponsorship of the Fostering Connections Act at a reception in Washington, D.C. in November. Berglind represented the Illinois child welfare community and thanked the lawmakers for their efforts in behalf of abused and neglected children across the country. Davis sponsored previous legislative proposals to support the role of kin caring for relatives–a precursor to the final legislation. He was one of the sponsors of the final legislation. Also attending the reception was Mark Testa, Director of the Children and Family Research Center at the University of Illinois and a CCAI member. 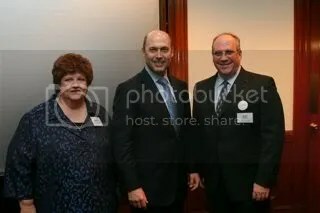 Marge Berglind, U.S. Rep. Jerry Weller (R-IL), and Mark Testa.